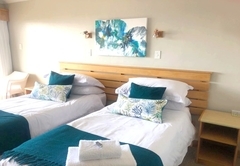 Aire del Mar Guest House is a highly recommended B&B with self catering option, providing accommodation in Gansbaai for tourists visiting the Cape Overberg region. 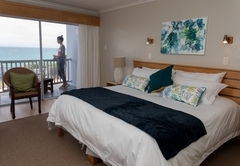 Aire del Mar Guest House, ideally situated only 2 hours drive from Cape Town in the quiet and small seaside resort of Kleinbaai, world known for viewing of the Great White Sharks. Aire del Mar Guest House, ideally situated in the Cape Overberg region (only 2 hours drive from Cape Town) in the quiet and small seaside resort of Kleinbaai (world known for viewing of the Great White Sharks), is the only guest house where you can actually see the shark diving boats leave from Kleinbaai's small harbour and follow them all the way to Dyer Island. 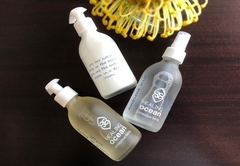 The guest house is less than 200 meters from the sea and only a few minutes walk from the harbour. 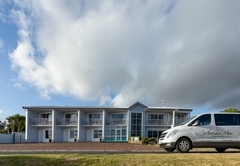 Five spacious luxury rooms, all with en suite bath rooms and balconies from which you have a spectacular unspoilt panoramic view over the bay of Dyer Island [world famous for its shark alley!] - from Danger Point all the way around to the light house of Quion Point in a distance. 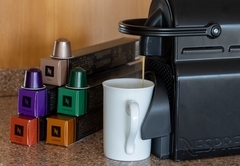 All luxury rooms are equipped with satellite TV, wall heater, kettle (with coffee and tea) and a wall safe for your valuables. 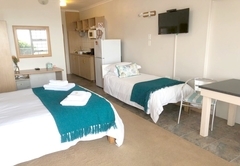 Two rooms have king beds, two twin beds and one a double bed]. 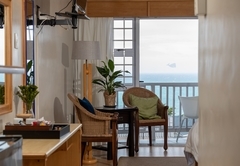 You start your day with a healthy breakfast and towards the end of the day you can enjoy sundowners from your own balcony or in our fully licensed bar. 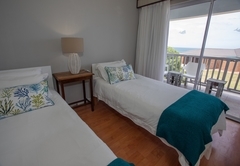 Three self catering studios - with sea view and en suite bathrooms. Two rooms have double beds and one has twin beds. They are equipped with a fridge and microwave and utensils to prepare a light meal. A flat which can accommodate a family, or four to six backpackers. Kleinbaai offers kilometres of coast line for pleasant walks in the "fynbos" (natural coastal vegetation). We can also assist you in planning of excursions to nearby Danger Point light house, Elim missionary station, Cape L'Agulhas (the southern most point of Africa), birding and lots more. On first floor of building. 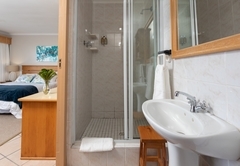 Luxury room with twin beds: white linen, coffee/tea facilities, safe, satellite TV, wall heater, en suite bath room with shower, and balcony from which you have a spectacular unspoilt panoramic view over the bay of Dyer Island. On first floor of building. 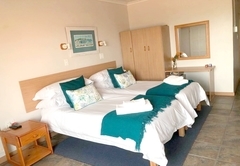 Luxury room with king bed, white linen:coffee/tea facilities, safe, satellite TV, wall heater, en suite bath room with shower, and balcony from which you have a spectacular unspoilt panoramic view over the bay of Dyer Island. On ground floor of building: Double bed, white linen, safe, satellite TV, wall heater, and en suite bathroom with shower, towels provided. 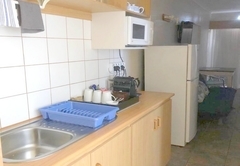 Small kitchenette with microwave oven, fridge and adequate utensils to prepare small meals. On ground floor of building: Twin beds, white linen, safe, satellite TV, wall heater, and en suite bathroom with shower, towels provided. 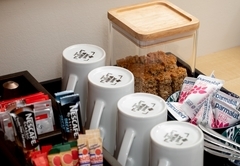 Small kitchenette with microwave oven, fridge and adequate utensils to prepare small meals. Very nice guesthouse- basic but comfortable and clean. Well located for the shark diving in Kleinbaai. The staff was very nice, and let my wife stay way past checkout while I was out shark diving. They went out of their way to make her comfortable- would stay again if I am ever back in the area . We were warmly recepted by the host lady Zelna, and we felt at home from the very first second. The room was exceptionally clean and the value for money can not be emphasized enough! The room had a beautiful view too. 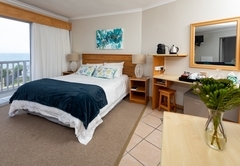 It is a very peaceful and safe guesthouse and we would definitely recommend it to anyone visiting the Gansbaai area!!! I will not stay anywhere else in the area. Thank you for a lovely stay Mrs. Zelna and all your staff. Response timeAire del Mar Guest House typically responds to requests in 5-10 minutes.